Friday marked the conclusion of the St. Louis Blues’ annual prospect camp, a week of drills and scrimmages for the prospects that have been drafted, signed, and traded into the organization in the last few years. It was the fans’ first look at the crop of 2018 draft picks, and a fresh opportunity for them to see some of the Blues’ advanced prospects, as well. We at The Hockey Writers were in attendance for parts of each day of the camp, and it is safe to say that the Blues have a bright future. For the 2018 NHL Draft picks, like Scott Perunovich pictured above, this has been one of the busiest and most exciting weeks of their lives. It began Friday when many hoped to hear their name called from the stage at the American Airlines Center in Dallas, TX, marking them as first round picks in the NHL. But even for those like Perunovich, who had to wait until day two to be chosen, being drafted into the NHL is a dream come true, especially because he had been passed over in two previous drafts. Perunovich joined six other selections, including first-rounder Dominik Book, whom the Blues traded up to draft at 25th overall. In the 4th-7th round, the Blues selected goalie Joel Hofer, forward Hugh McGing, forward Mathias LaFerriere, and defenseman Tyler Tucker. All six prospects joined a host of young players at this week’s camp. One notable absence from camp was the Blues’ foremost prospect, Robert Thomas. Selected 20th overall in last year’s draft, Thomas exploded up prospect rankings this year with an incredible performance in junior hockey. 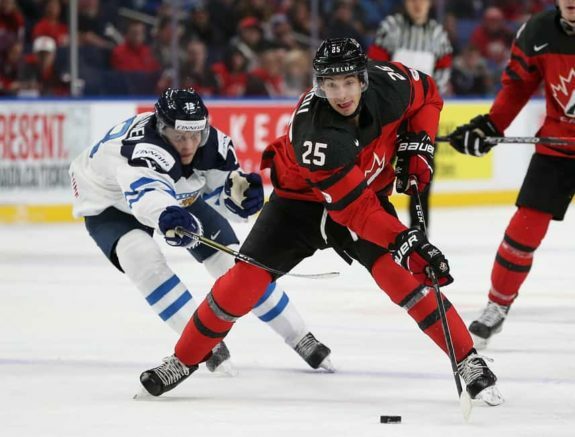 He earned a gold medal with Team Canada at the World Junior Championships and was named OHL playoff MVP for his championship-winning performance with the Hamilton Bulldogs. But Thomas was not on the ice this week. According to Jeremy Rutherford of The Athletic, Thomas is dealing with a minor leg injury sustained during the CHL playoffs, and the Blues decided to hold him out of camp to let him continue to recover. In reality, Thomas’ profile suggests that this camp would have been little more than an exhibition for him had he been healthy. Thomas is all but a lock to make the Blues’ NHL roster next season, and while fans may have been disappointed by his absence, the Blues made the right call. There is no reason to risk injury for a future cornerstone of your franchise. One of the new faces at this year’s prospect camp, who was not a 2018 draftee, was Erik Foley, the powerful forward that the Blues received (along with a first-round pick) in the trade that sent Paul Stastny to the Winnipeg Jets. Foley looked great during the week, fitting in well with his new teammates. He has soft hands and a hard shot and looked willing to play a physical game when it is called for. Likening his own game to that of Evander Kane’s is a promising comparison. Kane, who just signed a seven-year, $49 million contract to stay with the San Jose Sharks, is the kind of dangerous threat that the Blues desperately need to help take the scoring burden off of Vladimir Tarasenko. 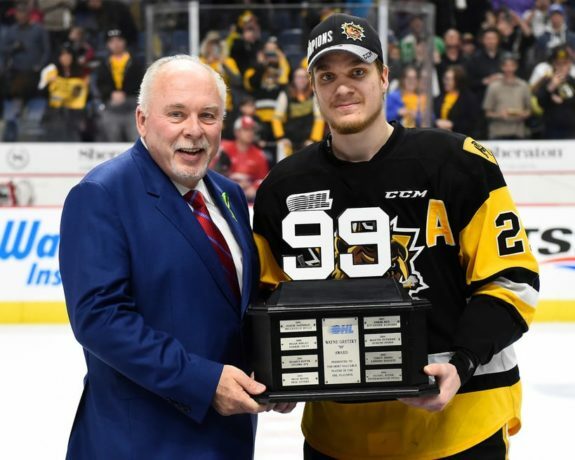 While Foley may not be NHL ready and may not be quite like Evander Kane, a player of that mold would be a considerable boon for the club. One player who stood out from the rest in this camp was Jordan Kyrou, considered by most to be the Blues’ second-best prospect behind Thomas. Kyrou led all OHL right wingers in points last season, scoring 109 in 56 games with the Sarnia Sting. 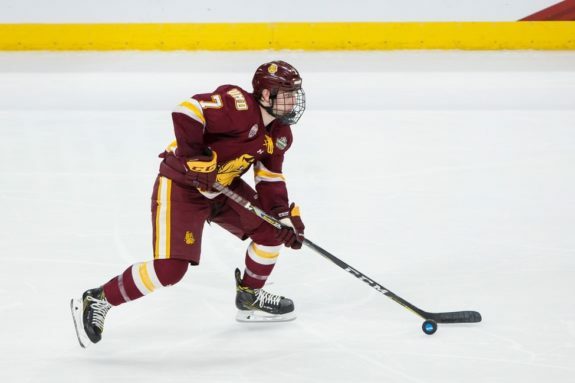 He spoke to Lou Korac of NHL.com about how this season’s prospect camp had a different significance for him as he’s trying to make the NHL team. If impressing the front office and earning a shot at the roster was Kyrou’s goal, he may have surpassed it this week. He looked electric almost every time he was on the puck. His skating was smooth and fast, as were his hands and his vision. He created plays for teammates regularly, and didn’t hesitate to finish a few himself. Perhaps the best moment of Kyrou’s week was when he streaked in on a 3-on-3 in scrimmage overtime and created a backdoor feed for Tyler Tucker to bury the game-winner. Blues fans have every reason to be excited about Kyrou, Thomas, and Klim Kostin as they make their way towards the NHL. All three are blue-chip prospects, with all the tools for success at the NHL level. But a few other players stood out as well. In the fourth round of the 2017 draft, the Blues selected Alexey Toropchenko, a Russian player who many tabbed as a steal. He’s big (6-foot-3, 191 pounds), physical, and talented; the Blues took a shot on a player with significant raw potential, who was unproven and who some doubtlessly feared would rather stay in Russia. So far, Toropchenko has shown no such desire. In fact, he played last year with the Guelph Storm of the OHL, recording 39 points in 66 games. At the prospect camp, he stood out for his size and talent. He has a great shot and more finesse than one might expect with his frame. He had strong chemistry with former (and possibly future) teammate Klim Kostin, as the two were inseparable in drills. If both materialize and continue to grow together, they could be a potent threat for the Blues in years to come. The surprising standout of the prospect camp was Blues’ 5th round pick Hugh McGing. A member of the Western Michigan University Broncos, McGing played for former Blues head coach Andy Murray. Murray compared McGing’s game to former Blue Andy McDonald, and you can see why. McGing’s speed jumps out at you, and he is aggressive and creative in many of the same ways McDonald was. McGing likely fell in the draft due to his size. Listed at 5-foot-8, 170 pounds, McGing does look a bit like McDonald but he plays with intelligence and tenacity. He created a good number of scoring chances during the camp and finished a number of them as well. It’s tough to know whether he would be able to create that kind of space in the NHL but if he finds a way, he has a bright future ahead of him. As with most teams, the Blues don’t have quite enough prospects to create two whole scrimmage teams, so they bring in help from the area. Several local players who have played in the NCAA participated including Grant Frederic, Austin Rueschhoff, Josh Dunne, Michael Davies, Adam Roeder, and Jacob Wilson. Ty Amonte and Jared Thomas also joined the camp, who were non-roster invitees from other areas. While these undrafted players have a long road ahead if they want to fight for spots in the Blues’ organization, they all represented themselves and St. Louis development programs, like Synergy Hockey run by former Blue Jamie Rivers, incredibly well. July 1 marks the official opening of the NHL’s free agency period and in the coming hours and days, Doug Armstrong and the league’s thirty other general managers will look to set a course for their clubs for future seasons. Whether Armstrong decides to hunker down, protect his prospects, and build for the future, or whether he opts to trade from this deep pool of assets and get immediate help remains to be seen. In either course of action, Armstrong has a deep pool of players from which to build, and Blues fans should be very excited about the future.